Photo Courtesy of Starlight Theatre. 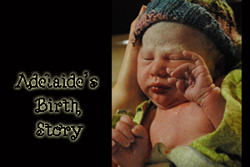 There's something to be said for a classic Broadway musical. 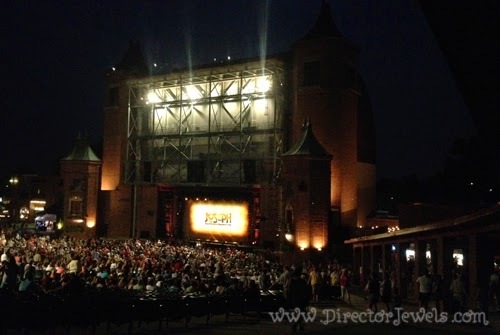 Don't get me wrong - I enjoyed the first two shows of the season at Starlight Theatre - The Wizard of Oz and We Will Rock You - this summer, but the one I was most looking forward to this year was Joseph and the Amazing Technicolor Dreamcoat. This show holds a special place in my heart as I was in a community theatre production of Joseph the summer of my wedding - and my hubby was Joseph. So, it's fair to say I'm a little biased. And I was (happily) not disappointed! Starlight is a magical place, where shows come to life under the cool night sky. The theatre seats almost 8,000 guests and we almost always run into someone we know from the theatre world, which is just a fun bonus. The live orchestrations magnificently carry through the air and create a beautiful atmosphere for a date night, family event, or even a group gathering (I would love to take my drama students to a Starlight show). Starlight has an on-site dining room - Applause Club - that offers meals before each Broadway performance. We've never been, but the food (catered this season by Plaza Catering) smells amazing! 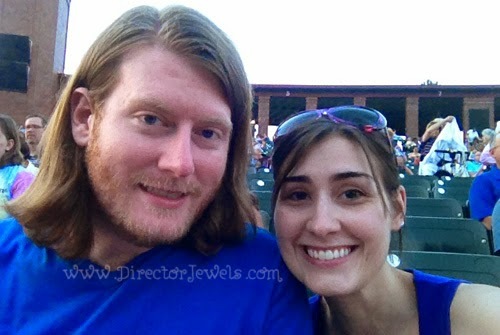 On one of our Starlight visits, we'll have to make it a full date night and eat dinner before the show, too. 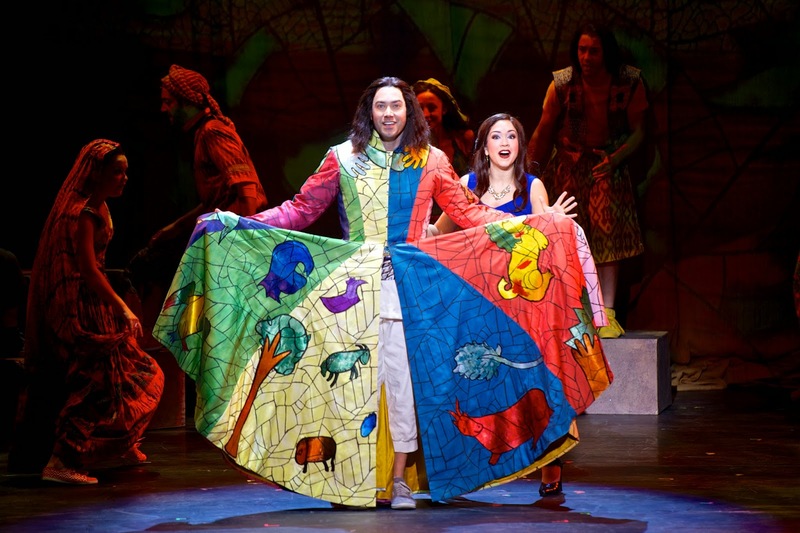 The production of Joseph and the Amazing Technicolor Dreamcoat that is playing this week is currently on tour in the US and stars former American Idol contestants Diana DeGarmo and Ace Young (who are newlyweds - awwww). I did not watch either season of Idol when these two talented performers were competing, so this was really my first time to hear either of them sing. The familiar music and lyrics of Andrew Lloyd Webber and Tim Rice were performed very well by this cast - even though I have most of the show memorized, I could tell that words were enunciated well enough to be understood by the crowd. That's tough with a fast-paced show with tons of lyrics! The show starts off set in the present and then takes us for a journey back "many centuries ago, not long after the Bible began" through the songs of the Narrator (DeGarmo). The story generally stays close to the Biblical record, while presenting each scene in a new era of music and costume style. This is part of the charm of Joseph - it's a solid show even though some of the pieces seem odd if they are left to their own. 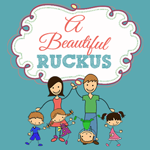 From the start of Jacob and Sons, this production is non-stop, fast-paced and fantastic. Director Andy BlankenBuehler was the choreographer in addition to the mind behind the production, and the seamless finished product is evidence of this. His vision of the show is very consistent throughout and expertly brought to life by the cast. 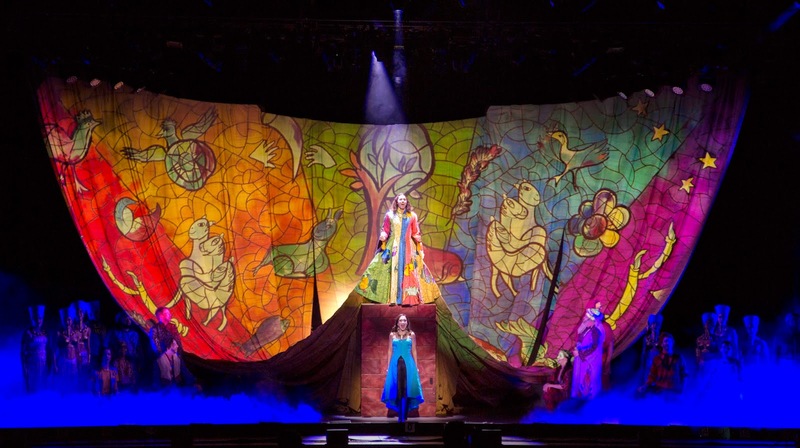 -Joseph's Coat and the use of literally every color mentioned in the song via projection onto the multi-use backdrop scrim. If you're familiar with the show, you know there are a lot of colors and some of them are pretty obscure. All 29 colors are also represented in Joseph's coat from designer Jennifer Caprio. -The (somewhat sparkly) sheep and goat. Just having them present made the story about this family of shepherds more believable. -The 1920's feel of the Potiphar scene is fun. 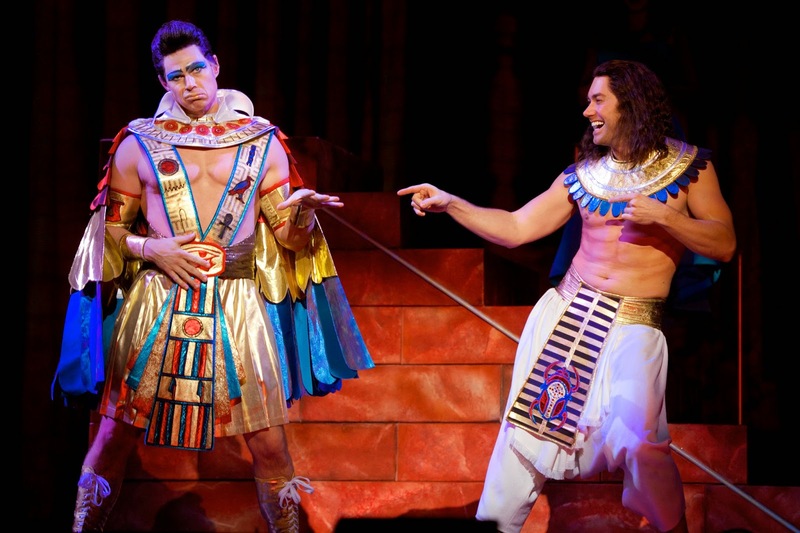 This scene is usually the least family-friendly due to the cavorting of Potiphar's wife, but I felt that without diverting from the song and story, it was not too over the top (especially compared to other productions I have seen). -Pharaoh, played by Ryan Williams, brought the house down with his hilarious Elvis impression during Song of the King. -Those Canaan Days, which showcased the talents of the brothers and was another crowd favorite. -Any Dream Will Do - one of my favorite numbers of the show. The reveal of Joseph's coat at the end was beautiful! As if the show were not enough fun on its own, we were also treated to a Joseph Megamix from the cast before the curtain fell. I've loved the Megamix song cut for years and may have rocked out to it in my car while traveling to and from theatre rehearsals more times than I care to admit. It was a perfect ending. 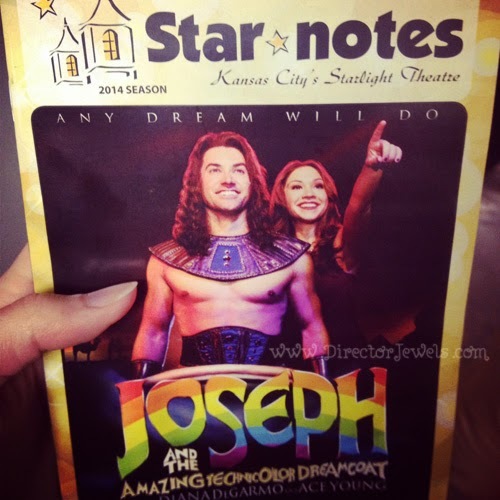 I enjoyed the entire cast very much, and thought that Diana DeGarmo and Ace Young were both cast well - they seemed to be having a great time, which is essential to a show like Joseph. 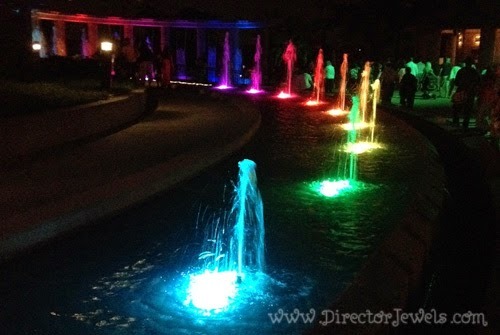 Even the Starlight fountains were technicolor for the occasion! Hands down, this was my favorite of the season so far. If you're in Kansas City, head down to Starlight and see this show before it leaves town! 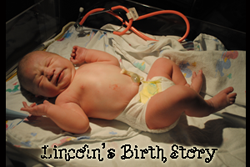 You have four more chances and can purchase tickets online here. Wow, I just got home from leaving at intermission from Joseph and the Amazing TechnicolorDream coat. I have been attending shows at starlight for over 40 years and never left at intermission until tonight. The production, lighting, costumes, dancing, acting, and singing were just not nearly up to what I am accustomed to at Starlight. I wonder if the Independent Production experiment is a factor. Cost cutting? to produce more profits into Starlight and the various other regional theaters? bypassing New York production may save money but I'm not sure I will renew season tickets if that continues to show up in the lower quality production. I'm not sure, but it just seemed way below normal quality. The American idol contestants voices sounded young and not yet mature, especially the female lead narrator. I won't give up yet, but this was not nearly up to my expectations. Hey Anonymous, thanks for commenting! I'm actually really surprised by your comment - it doesn't sound like we saw the same show. I'm not a season subscriber and have only been to Starlight maybe 8 times in the last few years, but this was BY FAR my favorite overall production in that time. I usually pick shows apart after they are finished, but I had very few negative things to say about this one. I'm sorry that it did not meet your standards! As far as casting - while I did not have an issue with either Ace Young or Diana DeGarmo's performances, I think it's unfair to suggest that NY productions have a higher standard in casting. I've seen multiple instances where celebrities have been cast in roles that may not be the best fit, for the (presumed) reason of drawing a crowd. If an actor or actress is popular, they will be cast regardless of their fit for the role. Example: Carrie Underwood in NBC's one-time live performance of The Sound of Music. I'd be curious what you thought about the first two shows of the season at Starlight this summer, as I saw both of those as well and had more nit-picky things to say after each of those performances.